We fired our financial planner. 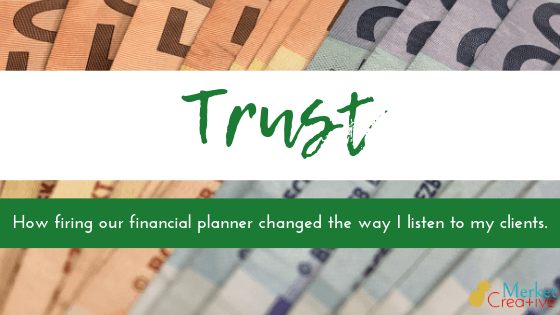 Let me rewind a minute… My husband and I met with a financial planner. We were finally comfortable enough to talk to someone about our financial future. It felt like a BIG deal. You see, I’m restructuring my relationship with money. To take this first step felt almost impossible. Like the first step out the door on your way to the gym. So we met with this financial planner. He was nice enough. We had a lot in common, so it seemed like a good fit. The financial planner was patient with our high energy. We explained our goals – to get out of debt as fast as possible – and he nodded and jotted down a few notes. He asked some more questions. We talked about future goals. We reiterated our short term goal of getting out of debt. After two hours of back and forth, we left the office feeling like this was a very adult thing to do. The next meeting didn’t feel quite as good. It was a sales pitch. Which makes sense. In the first meeting, one of my questions was how our financial planner actually made money. It all became very clear when we discussed in great detail whole life insurance. It was… how did he put it… “A little bit of money now for long term stability” or something like that. He replied that we could work on that, but this insurance was important to start right away. Ok ok, but… what about our debt? Wouldn’t it make sense to delay the insurance by a few months, using that chunk of change to get out of debt even faster? Apparently not. The sales pitch got harder. We said we’d think about it. Something wasn’t right. It all felt so good last time, but this time around I felt unheard. And like I was being gently guided into a trap – a human sized bear trap. So we left – queasy and unsure what was going on. I looked at my husband and saw in his face the same emotion I was feeling – confusion. We both said we’d think about it as the day went on, and after work we’d connect and talk through everything. As my day progressed I got more confused and angry. I could think of at least 3 instances over the pair of 2 hour meetings in which I had clearly outlined our exact debt amounts, monthly payments, and interest rates. I could think of several more instances in which I or my husband had clearly explained our primary goal was to get out of debt now, and then focus on investing and insurance next. We understood the need to invest as soon as possible, but the debt was most important to us. Why hadn’t the financial planner listened?! We spent the next several days trying to figure out how to fire this guy with kindness, while still giving feedback on why he was being fired. Our financial planner didn’t listen to us, our concerns, or our goals. It was all about him and the sale and what HE thought we should do. He lost our trust. And we told him so. After we fired him, the financial planner backtracked a bit – saying he now recommended a different plan to help get us out of debt fast – but it was too late. He’d lost us. Are you the “financial planner” of your business? And not just to what your cliens are saying with words, but the tone they’re using to express their concerns? Are you listening to their worries? Their fears? Their needs? Or are you just trying to sell a product? Are you taking their words and twisting them to fit your narrative? Are you losing trust? Or building trust? You build trust slowly, one interaction at a time. You build trust on social media, in email, with the work you deliver, and with each phone call with your clients. You build trust when you listen. You destroy trust when you don’t. I’m begging you… don’t treat your clients like our [former] financial planner treated us. You’ll build trust. And keep your clients, too. How do you build trust with your clients? Let me know in the comments below!